I heard Colin Cowie talk about how he has a signature gift wrap and that everyone should have their own signature wrap. His is a shiny dark chocolate brown. It looks like a bowlful of melted chocolate, just yummy. He even takes it so far as to leave personal stationery and cards at his favorite florist and confections store in case he needs a gift delivered. Now this man is beyond organized. I saw the Oprah special where they showed his apartment. Oh! My!! If I was not already married I would ask him to marry me. You should see his closets and even his refrigerator. He is always planning and thinking ahead. He is uber organized. Now back to the signature wrap. The other day while perusing blog land I went to Chinoiserie Chic blog which is one of my favorites. She does an amazing job with color in her home and it is all based around her love for color and Chinoiserie. She did a post on this wonderful wrapping paper sold at Caspari. If you have the time definitely take a look at their website they have some amazing gift wrap and who knows maybe you will find your own signature wrap. I loved the idea of a signature wrap so I thought about it for about one second and I knew exactly what mine should be. I think you all know what the answer is going to be!! My signature wrap is?????? I made a band out of tissue paper and then made tissue flower and cut striped leaves. I think it turned out pretty cute . It could be altered by changing the color of the tissue paper. Very simple to do and a fun package to give someone. I love to wrap gifts. I think the wrapping is part of the gift. I think the most unusual gift I ever wrapped was when I covered an entire box with moss . I used rafia to tie it together and embellished it with twigs and shells. It really turned out cool. I wish I had a picture to show you but I did that about 10 yrs ago. Do you love to wrap your gifts in a special way? What is the most spectacular gift wrap you ever have done? For those of you who love beautifully wrapped gifts for presentation you must go and look at The Gift Wrapped Life blog. Sande is the author and the talented lady behind wonderful gift wrapping and gift ideas. She talks about life, design and gifts. She is so articulate and makes all things in her surroundings lovely. She is truly an elegant lady. Tell me what you think you would like your signature wrap to look like. What color and what design would be on it? “Enjoy the Process” Of: Beautiful Presentation! I thought I would share a quick little makeover on a lampshade that I did for my porch. I purchased this lamp shade at Tarjay on clearance for only $13.88. It is a reverse print so during the day it looks white and at night it looks so elegant and kind of mysterious and glowing. Love it!! I also bought the black chain trim on clearance for $1.49 a yd. I used approximately 2 yards. With a little fabric glue and about 15 minutes- Voila! I now have my own custom lamp shade. Averill at Odi et Amo recently did a great post on some quick make over's that she did. It goes to show you with a little ingenuity you can make quick easy changes. Be sure and visit her blog to see some of her transformations,here. See the reverse print, isn’t it fun!! I am really pleased with the way it turned out. “Enjoy the Process” Of: Making an ordinary lampshade look a little more special! BTW: The porch is done!! I am waiting for the rain to stop so I can take pictures to share with you. I love, love it!! I played the game what is the sixth photo in your picture file. Marija also tagged me on another game- Seven things you do not know about me. I had been tagged before and did not play however, I could resist no more. Now I am going to play! What are seven things that you don’t know about me? This is a hard one for me to play. I tend to be a pretty private gal about my personal life and family in a public forum. It is hard to talk about ME without talking about the most important thing in my life and that is……. Family: I have three gorgeous grown sons for whom I would do anything. My youngest son has gone back to school to get his degree. The two older boys are married to the most incredible women who are amazing Mothers to my three perfect and gorgeous grandchildren. They are my heart , they are my JOY!! Togetherness: Nothing gives me greater joy than to have all my kids and kiddo’s here and a good meal on the table. It really is the simple things in life that give me the most pleasure and it always involves people I love. Work: I have been a decorating consultant for over 30 yrs and I just recently retired. Well, at least physically I have retired- no more house calls. Let’s face it, we creative types never quit. The mind keeps turning and turning. I am enjoying helping family and friends with their decorating projects. Love of color: I am fascinated with color and love to choose colors for people’s homes. It is the one thing that I feel very confident in doing. I have been tagged by Marija at Holding Court blog. I love her blog and her insight on fashion and design and sometimes just on life itself. She is so articulate and a very talented lady. I have been tagged before and I did not play the game, but felt a little badly about it. There are just so many wonderfully talented, nice bloggers that I did not feel I could tag just a few for certain awards that had been bestowed on me. I always made sure that I went to their blogs and thanked them hopefully, in a gracious manner. Marija has tagged me with the sixth photo challenge and that is something I think I can participate in. I started blogging in January and oh what fun I have had. As I am writing this right now I do not know what my 6th photo will reveal. I will be right back and we will find out together, give me just a minute………..
Oh how fun!!! It is from my Black and White post. I loved this upstairs sitting area with its ebony floors and black table. 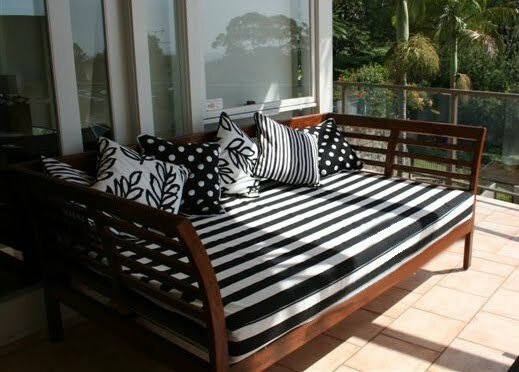 The black and white settee was a favorite of mine. You know how this girl loves her black and white. I really liked doing this. I wonder what the first photo is, in my sixth post ???? This was from my PPL post. I used this picture as an example of what plants can do for a room. I can not even imagine this room without this plant in the corner, can you? Since we are doing 6’s why don’t we see what is the first picture in my 66th post? Oh! This is the bedding for the playroom bed for when a sweet little girl spends the night. I have two sets of bedding- one for girls and another set of bedding for boys. You can see it on this post. Now for my last 6! Let’s see what the first picture is in my 106th post…….. 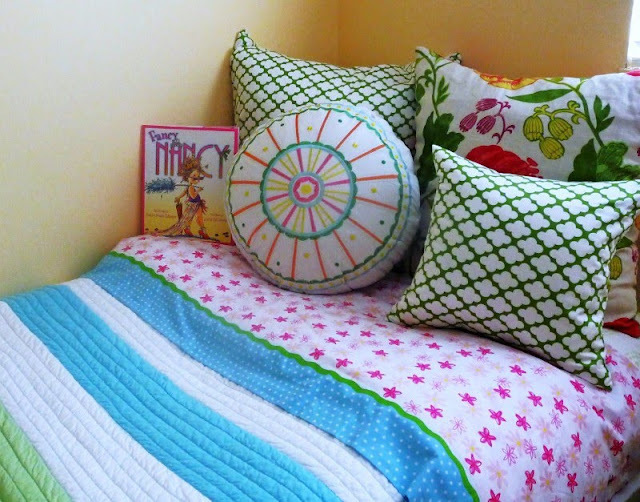 In this post I tell you about how to disguise your bed pillow storage. That was fun for me. I hope it was for you. Greek Key Footstool and Spray Paint! I walked in to the store the other day and what did my eye’s see? A footstool! Not just any footstool but a metal Greek Key footstool. I love the Greek Key pattern. I did a blog post on it here. I had to use my imagination because the footstool was in a bronze metal with a brown micro-suede fabric. You all know that I am not a brown or a micro-suede girl. I looked at it , I lifted it. Aaaah! Yes! it was nice and heavy, definitely worth purchasing………. Now what do you think I did with this footstool? I have finally joined all of you out in blog land and I bought a can of flat black spray paint and primer. I am so pleased with the way it has turned out. Now, one more question. Where do you think this new foot stool will be going? If you guessed the front porch you are absolutely right. Oh! I forgot to tell you the best part. This nice heavy metal footstool was purchased at none other than Big Lot’s. Can you believe it? I purchased it for $45. 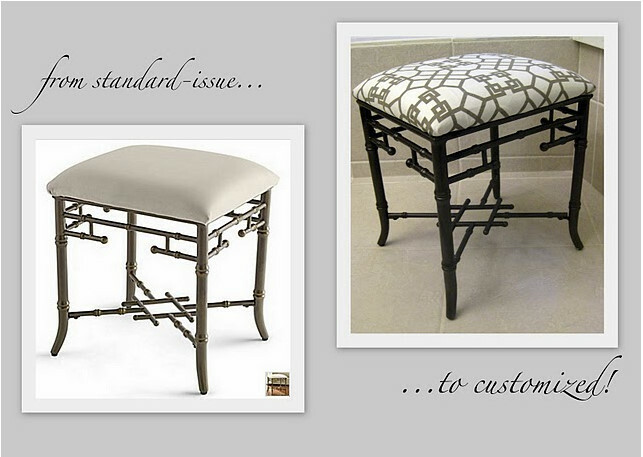 If you would like to see another footstool makeover be sure and visit my friend Averill’s blog, Odi et Amo here. I love what she did in her master bathroom it is wonderful! “Enjoy the Process” Of: Changing a piece of furniture with spray paint and fabric. Do you have a friend that just seems to come to the rescue just when you need her? Well, I do!! I was talking to my friend and we were sharing Spring Fever stories and the projects we were working on and the one’s we wanted to do in the future. I just love talking about stuff like this with my friends. Anyway, I started telling her the porch saga and my plans to make a No-sew panel for the porch. She offered to actually sew it for me!! Yippee!! I still can not believe she is going to do it for me. I am one very lucky girl!! Oh I forgot to tell you that I bought 3 yards of fabric and then upon further thinking about it I actually needed 6yds since the panel is double sides, Duh!! That meant another trip to the store for more fabric. My sweet, sweet friend made the panel today and hopefully we will get it hung soon. So I am on my way, except for the replacement cushions. I also need to find a rug but have one in mind. Soon, I hope, I will be done. I just hope by that time the flowers don’t die and need to be re-potted. “ Enjoy the Process” Of: Sharing plans with friends. My porch saga continues. In my exuberance to be Miss Clean Jeans I washed the cushions for my chairs. Before I washed them I repaired some stitching that had come loose. Now remember I know how to sew but it is not something I like to do at all nor do I have a sewing machine. I mended them by hand, washed them and they came out of the wash pretty well. I was very pleased, but being anxious to get the porch put back together I dried them. Mistake!!! They shrunk and now they are not the right size for the chairs. This would not be a big deal but these cushions are round not the ordinary square cushion. I need 19” round cushions in a natural color. I have looked all over and I can not find ready- made in that size. This is starting to become the Never Ending Story!! Oh I almost forgot, I also bought a rug. It is a jute rug with a simple black pattern. Most would probably have liked it but I am the girl that likes things to be a little understated and the pattern just felt too busy. So, now I need two new cushions and a rug. Will this ever end? Do you ever start a project with great enthusiasm only to be stopped by snags in your plans. I can compromise but not on the over-all look. I will wait until I can get what I had in mind when I started the whole project. I did a post on Sunday about working on my front porch. I did some sprucing up and some Spring cleaning. I am looking to spruce it up a bit more. I have wanted to put an outdoor curtain on my front porch for quite awhile and just never got around to it. I have saved pictures of outdoor curtains being used on patios, pergolas and the like. I finally am going to take the plunge and do it. You all know how much I love black and white awnings, right? Well, I don’t have it in my budget right now to do that, however, I can buy 3 yards of black and white striped fabric to make a curtain for my porch. 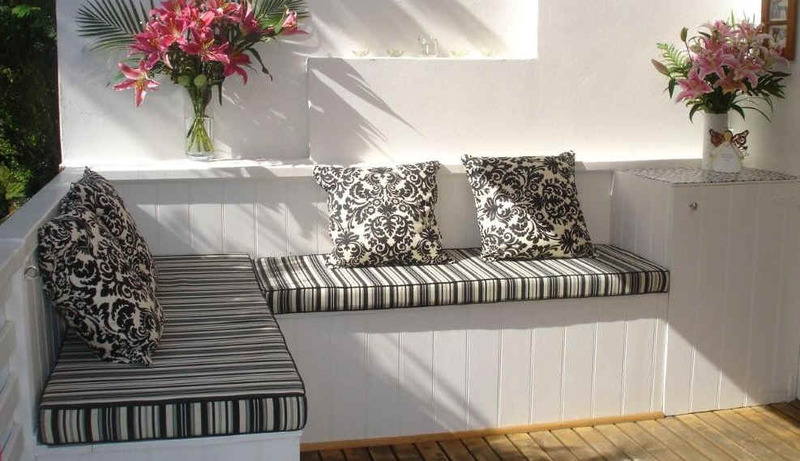 I have a great fabric store close to where I live called, Home Fabrics where they sale oodles of designer fabrics including outdoor fabrics at amazing prices. 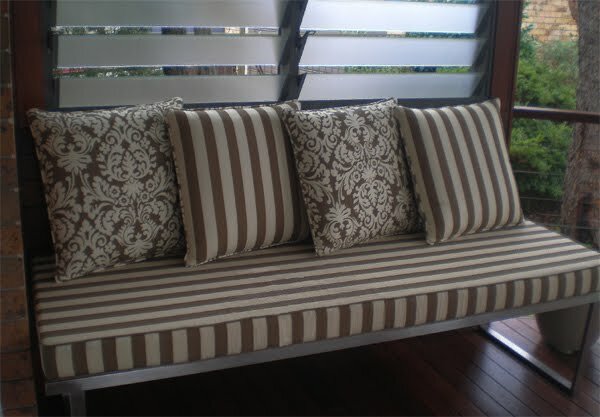 I wound up getting just a cotton stripe because it is softer than what they had in the outdoor fabrics. I thought it would hang more nicely. I got it for $5.99 a yd for 54” goods. Pretty cool!! Here is the fabric………. In a perfect world I only wish!! Oh My Goodness! This is unbelievable. Amazing lanterns and furniture. Although the chairs do not look very comfy, do they? You can see I have plenty of inspiration! Now for the funny part. Well, it is actually not very funny- maybe a bit odd. I don’t sew!! I know how to sew, but it has been years and I don't have a sewing machine. I am going to attempt to make these panels with that iron-on tape. I will let you know how it goes. If I am lucky and it works I will have pictures to show of my finished results. Wish me Luck!! Have any of you used the iron-on tape for any of your projects? Let me know how it worked for you in a comment. “ Enjoy the Process” Of: Making a NO-Sew project, Yikes!! I posted earlier this week about my Spring Cleaning and the Spruce-up of my front porch here. I thought I would show you my porch emptied out and a little sneak peek of some of the elements that are going to be on the porch. Here is my porch all emptied out, ready for its sweep down and hose down. You can see some of the spider webs by the timer on the wall. We killed two black widows. Now you have to understand this is where my chair sits. I have my coffee there in the mornings, Yikes. Don’t worry Hubby sprayed after it was all cleaned up. 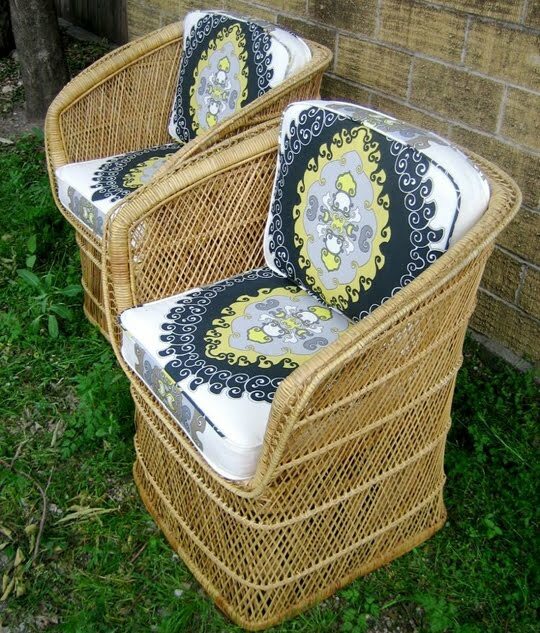 It is a small porch measuring 16ft long by 4 ft deep but it is big enough to have two chairs comfortably. Now for a few pictures hinting of what is to come!! That is all the hints you get for now. I think you can tell what colors I am using, can’t you?! “Enjoy the Process” Of: Making Your Home Look Like Spring has arrived. I have shown you my master bath here. I have told you about my little tricky way of hiding my pillows here. Now I am going to show you where I lay my head at night. In choosing the colors for my Master bedroom I used the ocean as inspiration. I love the ocean and if I had the financial means to live by the ocean I would be there in a second. I do feel very fortunate to be able to visit Carmel by the Sea quite often. I had a hard time finding a blue that was soft enough without being too clear of a color, therefore making it look like a baby boy’s room. I wanted a blue with a hint of green but I did not want it to be a turqouise room. I couldn’t find one so I worked with my tinter to make up my very own special color. We finally got the perfect blue for my taste. I also wanted the color of sand so I chose a creamy bedroom set. Yes, I said set!! I know I don’t usually go for a set but this was too perfect not to keep together. I used a Hotel bedding duvet cover that had a soft sand colored framing embroidered on it. I already had the duvet for about 10yrs or so. ( I keep my bedding pretty basic so it last a long time) I fold it at the foot of my bed as you can see in the pictures so it does not get very much wear and tear. The bench at the foot of the bed was a real find for me. I wanted a blanket chest for storage and I wanted it to be a small check in cream and sand. I was at Homegoods and I heard angels sing I saw a soft glow and there it was! The perfect bench for $199. Can you believe it . Okay there were no angels singing or a glow but it was really cool to find it there!! On my side of the bed I have a small night stand that has a drawer for storage and a shelf for books. The urn shaped lamps are vintage 1940s that I bought years ago and kept for this very room. The vase is also vintage and goes perfectly. I also have glass balls with bubbles that remind me of water. The mirror is made to look like capiz shells. I found the mirrors at none other than Homegoods. I love that store! On my hubby’s side is a bachelor's chest. It has great storage for some of his clothes and some of mine too. You will notice the symetry of the matching lamps and mirrors. I chose to put a pop of lime in here for a Spring look. This is my armoire. It has amazing storage capacity. Behind the mirrored door is where I stack all my white towels and sheets. On top of the armoire I have 3 blue/green glass bottles that I purchased at Big Lots for $9.99 each and three seashells. One is from Hawaii and the other two are faux. What a nice word for fake. So, this is where I lay me down to sleep every single night. I am so excited I recently found some new shams and a duvet cover I will share in another post. I love a little suspense!! Making your bedroom a personal sanctuary. I don’t know about you all, but I have a lot of bed pillows. I have pillows to sleep with, pillows to cuddle, pillows for decorative shams and pillows for guests only. Since pillows are a lofty item, they are not always easy to store. I need to be able to get to my pillows in case someone spends the night. So I have to store them somewhere that I can get too easily. I have a little hidden decorative way to use my lofty little friends. If you saw my post on comfy beds, here you know that I love a fluffy comfortable, semi-casual bed like this………..
Notice at the end of each of these beds how lofty and puffy the duvet is? The down comforter inside the duvet cover might just be lofty, but………. I have a way of adding some loft and also for storing my bed pillows. Are you starting to get the picture? I place two pillows under the fold of the duvet cover and I have a nice lofty, puffy duvet folded at the end of my bed! Aren’t I a tricky gal?! Another idea is if you do not have a down comforter or a duvet cover you can actually take an extra sheet and wrap three extra pillows and make it look like a duvet. 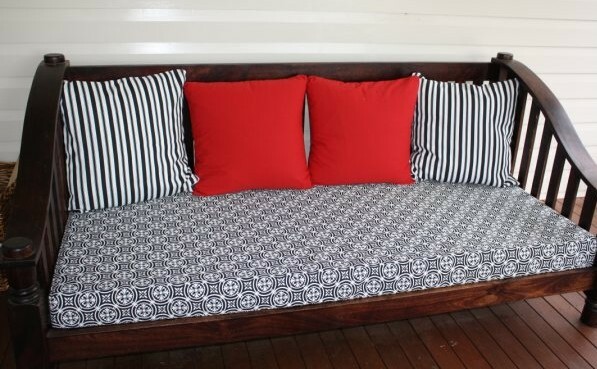 This is also an inexpensive way to add a touch of color to the end of your bed or just to make it look more inviting. Look in your linen closet and see what sheet would make a good duvet cover for your bed and try it. No money spent in this process, just using what you already have. Now, that is the best kind of decorating, don’t you think? “Enjoy the Process” Of: Finding ways to fool the eye in your home. I Need A Little Encouragement! I have been given permission from Sande at A Gift Wrapped Life for some, “Allowed Procrastination.” She said it is allowed on Sundays and it is Sunday, right? I am actually making some progress. I am taking a little break before I go back out to the porch with the hose in hand. Potted the plants into the pots. Removed all furniture onto lawn for a wash down. Removed screen from window to also wash. Swept down all loose cob-webs. Scraped loose paint off of wall planter. Trimmed dead limbs off my Meyer fern that thinks it is an octopus. This is where I sit in the mornings and drink my first cup of coffee . Sit down and enjoy my efforts!! After my lunch break I am putting on my ugly hat to protect my hair from the showers that are about to ensue on my front porch. I am getting my hose sprayer and hosing everything down. I love this part because it is like playing in the sprinklers. Wish me luck!! I can use all the encouragement I can get in order to get this done. “Enjoy the Process” Of: Spring Cleaning!! I was in Cost Plus yesterday looking for a new outdoor rug for my patio. I of course had to walk around and look at all the little pretties they have. When I shop I always look at items from a design perspective, not just from an, ”I want that for me perspective.” I saw these window panels that I thought had such a current look. They are a cotton sheer voile with a jute string going horizontally to create a subtle striped affect. They come in an ivory which is just a soft white and a silver blue/green and a plum. The white and the blue are what caught my eye. I know how many homeowners are loving the burlap look that has been so popular the last few years or more. I think this would be a subtle way of introducing that texture without being over done. I wish the picture gave them justice. They truly look much better in person and are well worth taking a closer look at in the store……. You can find them here and for $9.99 a panel I think for a summer look they could give some freshness to a room. This next panel is not on sale but at $24.99 I thought it was well worth the price. It reminded me of something you might see from Anthropologie for half the price……. I love the little lime colored bird on this panel. It is appliquéd and it looks more expensive in person than in the picture. Well worth going to look at in the store. Just to let you know, I did not find my rug so I am still on the hunt . I am suppose to be outside as I am typing this planting a little ground cover in the back and cleaning off the front porch. Can we all say, PROCRASTINATOR!!!! “Enjoy the Process” Of: Adding a little Spring/Summer freshness to your rooms. In blog land we are seeing a lot of beautiful all white interiors. There seems to be two camps. One camp that prefers all white and another that prefers to have color in their interiors. I love an all white interior in photo images and even to visit a room in all white. I am not sure I could live with all white in my own personal home. I do have to have color in my decor except in one particular item in my home and that is towels. I think there is nothing prettier than a stack of fluffy white towels. I have used all white towels for as long as I can remember. If you are as obsessed enamored with towels as I am you might like to read another post I did here. So, let me ask you. Are you in the all white towel camp or are you in the color towel camp? What color of towels do you use? Boy! I am just full of questions today!! “Enjoy the Process” Of: Finding out how many people prefer white vs.... colored towels.